The Journal of Animal Sciences and Livestock Production (ISSN-2577-0594) is an academic journal providing an opportunity to researchers and scientist to explore the advanced and latest research developments in the field of veterinary sciences and related academic disciplines. 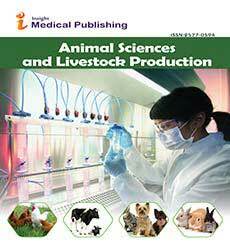 The Journal of Animal Sciences and Livestock Production is of highest standards in terms of quality. Journal of Animal Sciences and Livestock Production publishes articles related to animal studies including animal nutrition, veterinary science physiology, veterinary medicine and behavior; diagnosis, treatment and prevention among animal diseases including wild, domestic and avian. Veterinary Science is the science of diagnosing, treating and curing the diverse types of diseases in birds and animals. The subject broadly covers the study of animal physiology, treatment and prevention of diseases among animals. The basic principles of this specialized branch of study are quite similar to that of human medical sciences. It involves not only taking care of animal health but also includes scientific breeding and handling of livestock. Research in veterinary science is well known as animal experimentation, animal research, and in vivo testing which involves in the use of non-human animals in experiments or research and development projects, especially for purposes of determining the safety of substances such as foods or drugs. American Journal of Veterinary Research, Japanese Journal of Veterinary Research, Korean Journal of Veterinary Research, BMC Veterinary Research, Canadian Journal of Veterinary Research, Onderstepoort Journal of Veterinary Research. Animal biotechnology is a branch of biotechnology in which molecular biology techniques are used to genetically engineer (i.e. modify the genome of) animals in order to improve their suitability for pharmaceutical, agricultural or industrial applications. Animal biotechnology has been used to produce genetically modified animals that synthesize therapeutic proteins, have improved growth rates or are resistant to disease. Meeting livestock nutritional requirements is extremely important in maintaining acceptable performance of neonatal, growing, finishing and breeding animals. Animal nutrition focuses on the dietary needs of animals, primarily those in agriculture and food production, but also in zoos, aquariums, and wildlife management. Animal nutrition entails the study of the composition and characteristics of the material consumed by the animal, the manner in which this material is metabolised (converted, utilised, and excreted) in the digestive tract and body cells of monogastric animals (pigs, broilers, layers), ruminants (sheep, cattle, goats), and lower digestive tract fermenters (horses, ostriches). The nutrient requirements of different species animals for various production functions are also addressed. Finally, this information is integrated in an economically feasible and practical system of animal nutrition to ensure that the optimal genetic production potential of animals is achieved. Animal Cell culture is in vitro maintenance and propagation of isolated cells tissues or organs in an appropriate artificial environment. Many animal cells can be induced to grow outside of their organ or tissue of origin under defined conditions when supplemented with a medium containing nutrients and growth factors. In a cell culture technique, cells are removed from an animal and grown subsequently in a favourable environment. For animal cell culture the cells are taken from the organ of an experimental animal. The cells may be removed directly or by mechanical or enzymatic action. The cells can also be obtained by previously made cell line or cell strain. Animal breeding is a branch of animal science that addresses the evaluation (using best linear unbiased prediction and other methods) of the genetic value (estimated breeding value, EBV) of livestock. Selecting for breeding animals with superior EBV in growth rate, egg, meat, milk, or wool production, or with other desirable traits has revolutionized livestock production throughout the world. The scientific theory of animal breeding incorporates population genetics, quantitative genetics, statistics, and recently molecular genomics. The term anatomy refers to the science that deals with the form and structure of animals. All animals are made up of cells, some of which are specialized to carry out different functions. Simple animals, such as sponges, are made up of only a few types of cell. In more complex animals, cells are organized into tissues, such as muscles and nerves that are necessary for movement. Tissues can form organs, such as the heart, which is used to pump blood around the circulatory system.